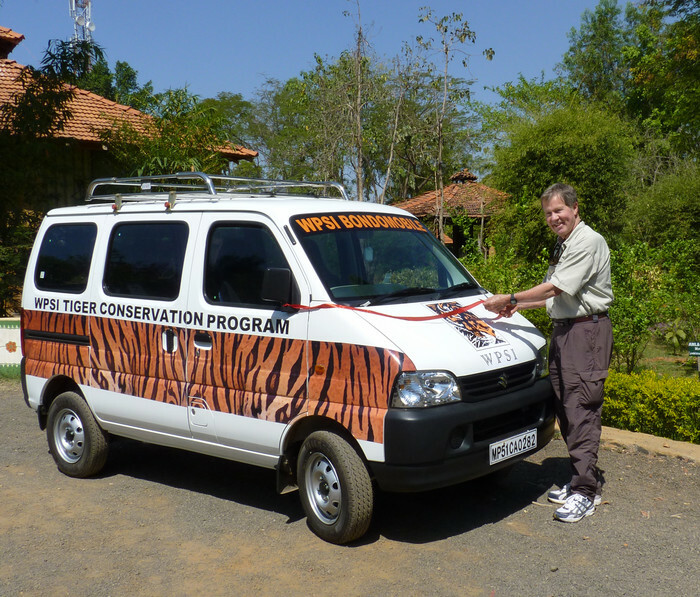 On March 15th, 2011, The Fund For The Tiger, in partnership with The American Himalayan Foundation and with the generous support of David Bonderman, launched a new program of the Wildlife Protection Society of India (WPSI), codenamed Operation Bondomobile. The program uses an audio-visual van, painted with a band of tiger stripes, which is systematically taken to all the villages fringing the tiger reserves of Bandhavgarh and Kanha, to screen a local language version of a film called *The Truth About Tigers, and to dialogue with local communities about their wildlife related problems. The aim is to reduce tiger poaching and human-wildlife conflict by addressing the antagonism between local people and the Forest Department and by informing the villagers of government projects that they could benefit from, such as compensation for cattle and crop losses from wildlife. In its first and a half year, 103 wildlife film shows and meetings have been held; 73 around Bandhavgarh Tiger Reserve and 30 around Kanha Tiger Reserve. More than 21,025 villagers attended the film shows and meetings; 227 grievances for compensation for livestock losses and crop damage by wild animals have been filed; and 15 wildlife criminals have been arrested through the Secret Rewards Scheme. Now in its third year of operation, the Bondomobile has visited 168 villages and 23,390 people in the past year and a half. It is completing its tour around Kanha and will soon return to the Bandhavgarh area. The Bondomobile program has proven to be even more successful than anticipated. Apart from creating large-scale awareness of the plight of the tiger in the tiger reserve fringe villages, the Bondomobile has helped address the deep-rooted issue of corruption, becoming a true ombudsman in the airing of grievance between the villagers and the Forest Deparment. The program has helped spread awareness in these villages about WPSI’s Secret Information Reward Scheme and has become a valuable source of information on illegal wildlife activities. Recognizing the benefits and the positive outcomes, after some initial hesitation, the Forest Department is also now very supportive of the program. *The Truth About Tigers is an unflinching look at the ground realities that prevail in India's forests. It’s a film that tells it like it is, and it is a must see for all those who are interested in helping to save this remarkable animal. The film guides the viewer through the life of the tiger, from birth to death, clearly explaining the reasons why tigers are declining. More importantly, it provides pointers on what the government should do to reverse the decline, and what ordinary citizens can meaningfully do to contribute. The film was made by award-winning wildlife and conservation filmmaker, Shekar Dattatri. The link is www.youtube.com/truthabouttigers. The clear message of this film is a simple truth we have been expounding for years…give tigers enough land, prey, protection, and they will flourish. Operation Bondomobile has been supervised by M.C. Khare, the WPSI representative who’s work we have been supporting in and around Bandhavgarh since 2001. The Fund for the Tiger Copyright 2016 All rights reserved.